A change of allegiance in 1942 by Lincolnshire Road Car from the BET (British Electric Traction) to the Tilling group of companies led to a switch from Leyland to Bristol chassis and from a variety of suppliers to Eastern Coach Works for most new vehicles purchased. 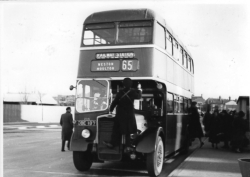 It entered service at Holbeach depot, mainly on route 65 (Spalding - Kings Lynn) carrying fleet number 661. 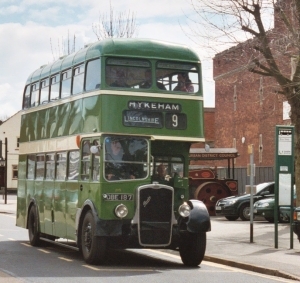 The bus spent much of its working life at Holbeach, although it frequently appeared in the late 40s on service 6 (Lincoln - Skegness) then operated from Skegness, Horncastle and Lincoln depots. 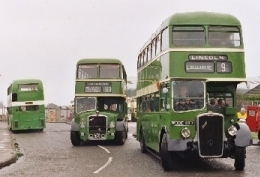 A fleet renumbering programme in 1953 saw this bus re-numbered 2115. Three years later, it returned to ECW for rebuilding - this being made necessary by the use of unseasoned timber on early post-war bodies. No. 2115's last few years in service were spent at Skegness depot - mainly as one of the buses drafted in to Skegness for the summer season, when (as now) services were enhanced. No. 2115 was withdrawn from service in 1964. It was subsequently used as staff transport on a farm at Soham, Cambridgeshire until 1978 when it was acquired for preservation. Memories of 2115 in service by a former Lincolnshire resident and Skegness depot conductor can be read here. In Service - DBE 187 in service as Lincolnshire 2115, Spalding Bus Station. Note the conductor changing the destination display. Back In Service - DBE 187, in the company of Bristol Lodekka and VR, about to make its first run 'in service' - LVVS Open Day, Easter 2005. It was acquired, in a partly dismantled state, by its current owner in 1984, and moved to the Museum - a lengthy and extensive restoration followed, and it finally took to the road again in late 2004, after receiving its first MOT for 40 years! A full return to passenger carrying condtion took place over winter 2004 / 05, and it made its service 'debut' at our Easter 2005 Open Day. More pictures before and during restoration can be seen here. Lincolnshire 2115 in action on the park and ride service at our Easter 2009 Open Day event - video by d33206hg on Youtube. October 2011 - Floor treads of the correct type are now in place in the lower deck gangway. Some seats are also being re-trimmed on the lower deck. January 2012 - All the lower deck seat cushions are now reinstated, with new foam and coverings. July 2012 - Following the AEC rally Neil has repaired a radiator leak.